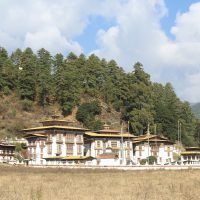 Paro - Bumthang - Punakha - Thimphu - Takstang Tour. 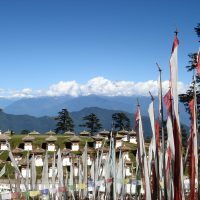 Bhutan Grand cultural tour is the best 10 day tour option for Bhutan. Grand Cultural is a step back in time for a glimpse of traditions and customs fast disappearing from the rest of the Himalayan world. 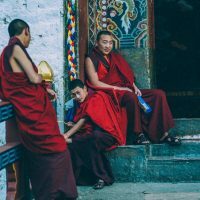 The small kingdom of Bhutan is so traditional, so ancient, and so completely- culturally intact that it can seem almost unreal. Here you’ll find an independent people who have not rejected their spiritual heritage for modern ways. They live in a gentle land of winding country roads, forests of juniper, whitewashed farmhouses, and verdant valleys dominated by thriving fortress-monasteries. In order to cover this extensive itinerary, we take advantage domestic flights between Paro and Bumthang, just started recently.As this domestic flight do not operate daily, we have to adjust the schedule accordingly. Due to weight restrictions rules of Civil Aviation, only between 25-35 passengers may fly at a time and therefore to adjust with the availability, it may be that you travel overland to Bumthang first and fly back to Paro at the end, instead of flying to Bumthang first. Arrive by flight into Paro.Upon arrival at the airport, clear immigration & Customs. Meet your Bhutanese Guide and driver outside the terminal, and after introduction, transfer to your hotel. This afternoon or evening as per your arrival time, transfer short distance to Rinphung Dzong, built in early 17th century. Like most dzongs, Rinphung Dzong houses both the monastic body and district government offices, including the local courts. Rinpung Dzong (meaning fortress on a heap of Jewels) is one of the finest example of Bhutanese architecture you’ll see. The massive buttressed walls tower over the town and are visible throughout the valley. Scenes from Bernardo Bertolucci’s 1995 film Little Buddha were filmed here. 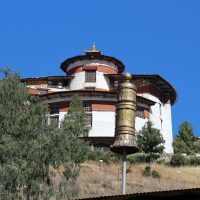 After visiting the Dzong, walk downhill, across a traditional wooden covered bridge that spans the Paro Chhu River, past Ugyen Pelri Palace and arrive in town area. Stroll around the charming small town of Paro, lined with colorfully painted wooden shop fronts and restaurants. As per available and interests, our guide will plan other visits accordingly. Overnight in hotel. In the morning, we visit Dumtse Lhakhang temple built in 1433 by the iron bridge builder Thangtong Gyalpo. 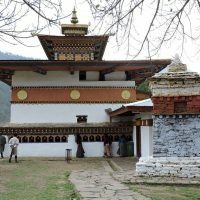 It is shaped like a chorten (stupa) with three floors and the murals inside are said to be some of the finest in Bhutan. 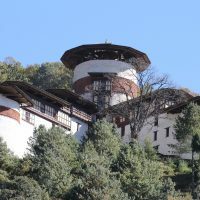 Then visit National museum of Bhutan, housed in an ancient Watchtower. Visit beautiful 7th century Kichu Lhakhang temple complex, one of the most sacred and revered places in Bhutan. In the afternoon, head short distance south to Bondey village and then take a short walk to visit a cliff-side temple complex of Dzongdrakha. Then visit local village and farm houses and return to your hotel. Transfer to the airport in time for your early morning flight to Jakar, Bumthang. Upon arrival, meet and transfer to the hotel. Bumthang is justifiably regarded as the cultural heartland of the kingdom with its many temples, holy sites, languages and traditions. We spend nearly two full days in and around Jakar visiting its monuments and cultural sights. Most places can be covered by drive but some places are easier and more interesting by walk. Among others, visit Kurjey Temple complex, the 7th century Jampay Lhakhang temple, Chakar Temple and Tamshing Monastery. Stop at the Swiss farm to sample local produce of cheese and beers. Visit local home, villages, and we may also have an opportunity to visit a school. We will also visit Kharchu Dratsang monastery, during their active evening debate or communion prayers. Visit Jakar Dzong and walk downhill through village and seeing some hidden shrines. See the giant water turned prayer wheels near Wangducholing Palace and if time permits, we can also visit Membartsho (‘burning lake’), a holy site where Pema Lingpa, one of Bhutan patron saint is said to have discovered religious treasures.Overnights in the hotel. You can also sample some local buckwheat dishes during your stay in Bumthang. 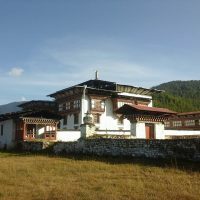 Alternatively, one full day can be used for excursion Tang Valley and Orgyencholing Manor Museum, which you can decide while you are in Bhutan. From Jakar, start early for a long drive to Punakha (210KM/7hrs). From Jakar, cross Youtongla pass and arrive in Trongsa. Along the way, we stop briefly to see the Yathra weavers in Chumey. In Trongsa, visits Trongsa Dzong, one of the most aesthetic and magnificent works of traditional Bhutanese architecture. It is a rambling collection of buildings trailing down the ridge with succession of beautiful courtyards, overlooking Mangde Chu river. Continue our scenic drive, passing many small villages, waterfalls with spectacular landscape, and cross Black mountains at Pele La pass (3420m). Mt. Jumolhari and adjoining peaks can be seen from here on a clear day. Lunch will be served along the way. After the pass, the road descends, passing through ever-changing vegetation and arrives in warm subtropical valley of Punakha and Wangdue. Overnight in hotel. Punakha and Wangdue Phodrang are administrative centers of their respective district. Located close to each other and being in the same valley, they are often described together. Compared to Thimphu, Paro or valleys of Central Bhutan, Punakha-Wangdue valley is at a lower elevation of about 1250m above-sea-level. Therefore it enjoys subtropical climate with warm summers and pleasant winters. The valley boasts two crops a year, along with growth of oranges, bananas and other subtropical fruits. Punakha was also the former winter capital of Bhutan, the tradition that is still followed by central monastic body. The head of the clergy of Bhutan with his entourage of monks spend the winter in Punakha Dzong and summer in Thimphu. 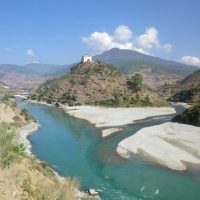 Visit Punakha Dzong, located at the confluence of the Pho Chhu (father) and Mo Chhu (mother) rivers. 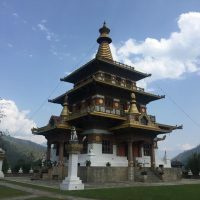 Drive short distance north of Punakha, through idyllic countryside, from where you can hike uphill through rice fields for about 40 minutes to beautiful Khamsum Yuelley Chorten, which stands out on a ridge with great view of Punakha valley. Later visit Wangduephodrang town and if time is available, you can take a short and easy walk to visit Chimi Lhakhang temple. Chimi Lhakhang is dedicated to popular saint Drukpa Kuenley, also popularly known as divine madman, famous because of the outrageous nature of his teachings which he administered in the most unexpected ways, often with strong sexual overtones and inclinations. Overnight in hotel. Our destination today is the Thimphu, the capital of Bhutan, about 3.5hrs west across Dochu-La pass (3100m). This spectacular pass is heavily adorned with countless prayer flags and a series 108 chortens. Panoramic views of eastern Himalayan peaks, (most of Bhutan’s snowcapped peaks) along the border with Tibet, can be seen from here. We stop to enjoy the view over cup of tea or coffee at the cafeteria. After lunch at your hotel, begin a familiarization tour of Thimphu visiting Tashicho Dzong, a revamped fortress that is the main seat of Government and central monastic body. Stroll through the town area and down to vegetable market. 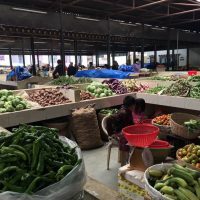 During weekends (Fri-Sun), the vegetable market is more active. Depending on available time, we may visit or incorporate some of tomorrow’s sights. Overnight in the hotel. 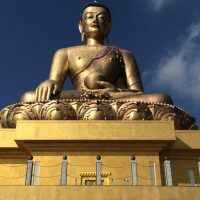 Thimphu being the capital has number of sights to visit and depending on which may be of more interest to you, the Guide will cover them first and visit rest as per available time. The main sightseeing tour of Thimphu valley include visiting Memorial Chorten, Changangkha Lakhang, Takin (national animal) Sanctuary, Sangaygang View point, Zilukha Nunnery, Traditional Art School (Painting School), Indigenous Hospital, National Library and Handicraft workshops. Later you can visit Textile Museum, Handmade Paper factory, National Smiths, drive up the valley north, towards Dechencholing palace area for general view of the area. In the evening there will be time for stroll on your own. Overnight in the hotel. 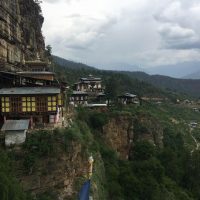 Drive to Paro (1.5hrs) and transfer directly to the trailhead for hike to famous Takstang (tiger’s nest) monastery, a quintessential Bhutan experience. Riding ponies can be arranged for uphill portion of the hike till the view point. The hike uphill to the first view point takes about 1hour and another hour to the monastery itself, but the whole excursion including the stops is expected to take all day. Return to Paro for final stroll around the town. Farwell dinner! Overnight in the hotel. Trip AccommodationBest available standard hotels in Bhutan. Options available for upgrade. 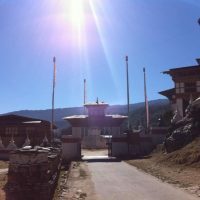 RouteThimphu - Gangtey - Jakar- Punakha / Wangdue - Paro. Trip SeasonsPossible through-out the year. Best from Feb till May & from Sept till Nov. Cost is based on number of participants and travel dates. From $2370 In Peak season.Cost is based on group size, dates of travel and types of accommodation chosen. • Single room supplement $320. From $ 1930 .If travels are within 1st Dec till 25 Feb and from 1st June till 25 August, following discounted rates apply. • Single room supplement $290. Please request cost after deciding on the choice of hotels. Flights into and out of Bhutan. (Visit Druk Air website). Internal flight cost from Paro to Bumthang (estimated around $150-250 Per Person) depending on the airline and date of travel. Contact us with dates. All personal expenses including optional tips/gratuities to the local staffs, drinks, beverages, laundry and other personal expenses. Flight was good, and Bhutan's guide and driver were exceptional. On the first day, I went for good walk from the fort to my hotel. Everything about the hotel was good, it was a great introduction to Bhutan. 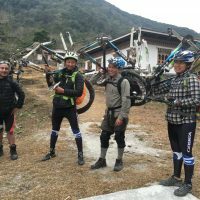 Alas, the next morning, my Right knee had blown up and was sore throughout the trip, though it didn't stop me in what I wanted to do.I rode a horse up to the canteen on the way to the Tiger's Nest Monastery, which is as close to it I got. The wealth of knowledge Tashi, the guide had was incredible, so each Dzong was a joy to visit. The Thimbu hotel was lovely and i could listen to the bells as the prayer wheels were turned. The weaving display, the memorial temple were very impressive and generally just being amongst the crowds was good. Panakha Valley was interesting too, and I went to a nunnery to listen to the chanting at 6.30am before driving to Bumthang. The roads certainly are an education, and it was so wonderful to see the respect of cows and dogs, even if they were in the middle of the road. Bumthang was a good place to spend some time, though as you know the flight was cancelled and I had to return by road to Paro. The homestay, such a historically rich place, was great. I was sorry I couldn't have stayed longer. Very smooth sailing leaving Paro. I've had a great time in Bhutan. As a general fashion everything went well and I've been very happy with the overall program. The driver did a great job and the guide was fine as well despite the miscommunication issues - This is something that he can easily improved by the way. 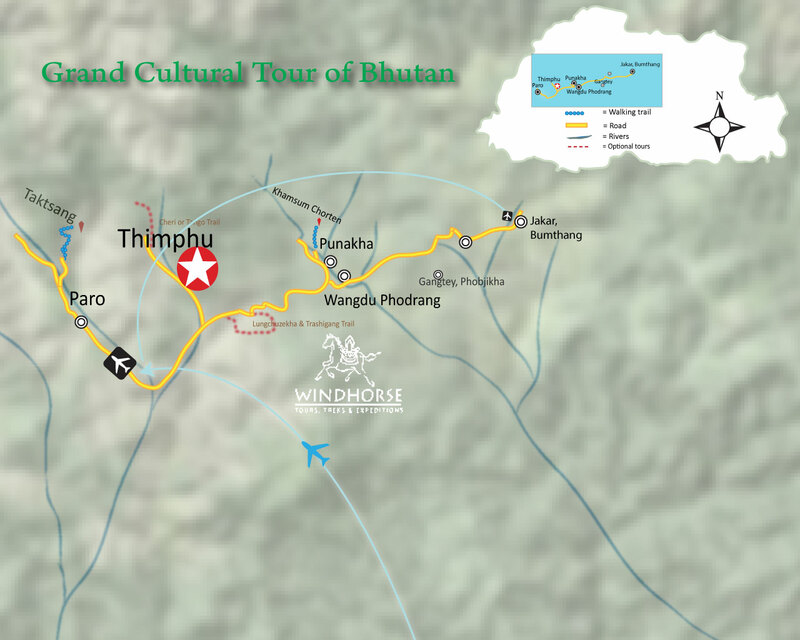 Some of my colleagues asked me for some references to visit Bhutan and I won't hesitate to recommend WindHorse tour. 5 " " We returned just yesterday as we stopped by Darjeeling on our way back. Our trip was very nice and provided a needed break after EBC trek. Everything went smoothly as far as the trip logistics go. Thank you! We returned just yesterday as we stopped by Darjeeling on our way back. Our trip was very nice and provided a needed break after EBC trek. Everything went smoothly as far as the trip logistics go. Thank you! Hi Yonten and Sonam; happy to get in touch with you again. We came back to Italy few weeks ago, after a fantastic time and custom trip in Bhutan. The travel was great, the accommodations really nice,the food excellent. We have to make a special mention of our guide, Sonam: he did an outstanding job both driving our pick-up and providing us with a lot of information, friendly, attentive, accommodating and helpful for 10 days, sometimes in very difficult moments along a road in restoration from west to east . The country has a fascinating history based on its religion. Sonam was able to let us know this spirit and the way Bhutan and his king are trying to preserve traditions, culture, people and natural ecosystem, even though opening to the world. 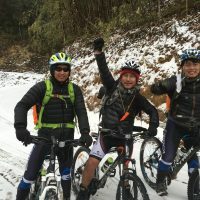 We are really happy to reccomend this company foranybody that wants to arrange a travel in Bhutan. Looking forward to planning another trip in future. 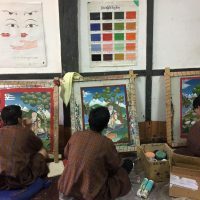 Visiting Bhutan was the trip of a lifetime. I am not used to travel with an organized tour, and was a little worried, but it was much better than I could have ever imagined. I would like to thank Ugen, Jambay and all the Windhorse team, for the organization, planning, professionnalism and the excellent service. Everything went just perfect. My very special thanks to Pema, for his kindness, incredible knowledge, respect, care, and friendship. I wanted to learn the most about your country and asked so many questions. Not one remained without an answer. My special thanks to Tenzin, too, the best driver ever, I felt totally safe in the winding roads to Bhuntamg, and did not feel sick at all. I really think your team is your most valuable asset. I wish you all the best, this trip will always be in my best memories. This is a quick note to thank you all for the support and wonderful vacation we had in Bhutan. We had very high expectations, and the trip was even better than we ever thought it could be. 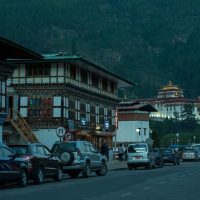 It usually goes by unnoticed when absolutely everything goes right, and we wanted to recognize the effort it takes to provide an excellent service, from the booking process to the moment we left Bhutan. Pema, besides being a great company, has incredible knowledge and social intelligence to skillfully to solve issues without us even noticing - this quality would have been missed by inattentive eyes. He was great at accommodating our every request smoothly into our schedule. Dawa is a phenomenal driver, by far the best we've met. He is also a delight to be around. Such a mountainous trip could have been disastrous, and to our surprise, not once have we felt uncomfortable or motion sick. Both of them even organized a birthday party to our surprise, and it improved an already perfect day. We are always hesitant when traveling with guides, after all, you don't usually invite two strangers to a family trip. However, their company most definitely made our trip so much better. You have in them very valuable resources. Please forward them our special thanks for their support, friendship and respect. Dear Kinga, We do hope that you had a successful trip to the UK in October. Sue and I were very pleased to meet you in Thimphu before you went. Windhorse certainly deserves to be in the top rank of travel agents for our type of holiday. Our trip to Bhutan was one of the most enjoyable holidays we have had. Over this Christmas and New Year period we have been composing our usual 'holiday album' and it has been bringing back happy memories of our time in Bhutan. We congratulate you on having such a successful organisation. 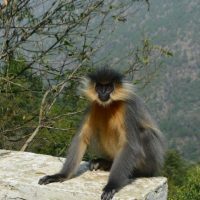 Your attention to detail in the organisation of our itinerary was excellent – and the itinerary was just what we wanted, especially as Yeshi knew just when it was sensible to depart from the plan! We were very impressed with Yeshi. He had a very good ability to judge just what we wanted, both in the amount of information he should give us about where we were visiting and in assessing how far/slowly we could walk! 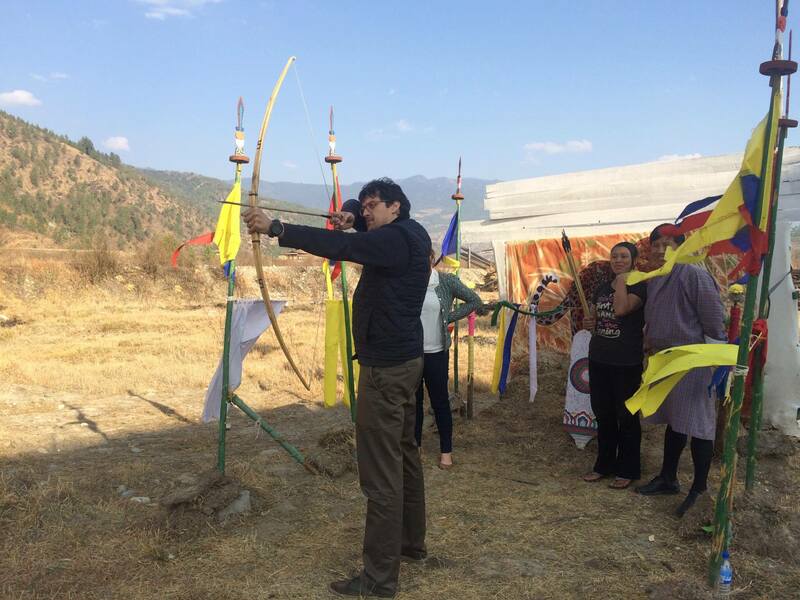 As well as seeing so many interesting buildings and places on our itinerary, we also enjoyed the unscheduled features, such as the visit to the paper-making works and the archery competition in Thimphu. We felt very privileged to meet his cousin and see her in her room in the nunnery near Bumthang. And our night in the best room in the Gangtey Palace hotel was a treat, even if it was only one night! We know that, behind the smooth-running of a trip, there is often a lot of unseen paddling below the surface of the water. As well as being very courteous, thoughtful and patient (and good company), Yeshi was very conscientious at making sure that we did not see too much paddling below the surface! Chimi, our driver, was also excellent. He was a very good driver – and some parts of the road were very challenging – but we always felt confident that we were in extremely goods hands, however long the journey was. We also enjoyed his company. Yeshi and Chimi made a good team. They even did an excellent litter-pick on the 'Windhorse' walk up from Dochula Pass – see attached photo (to follow)! We would recommend both of them highly. Incidentally, we have recommended Windhorse to a number of our friends who are thinking of visiting Bhutan – we hope something comes of it. Dear Jambay, We enjoyed our dinner with you and I am sure that I speak in behalf of my travel companions when I say that we came away not only with a great impression of Bhutan but also of Windhorse. The book you gave us on Bhutan is quite well done and has beautiful photographs. Our communications with you were consistently very efficient, the program was great, we liked the hotels, and both sets of tour guides and drivers were excellent. 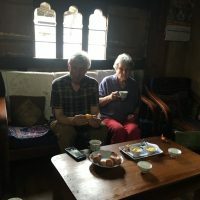 We learned a lot from Sonam and Kezang who were always on time, very attentive, flexible when we wanted to change something, and knowledgeable. When the trip was planned, road conditions were probably different but the day we drove from Trongsa to Punakha took over nine hours even without the planned stop in Gangtey which we had to cancel. The widening of the road meant that most of the trip (which started half an Hour late because a landslide had blocked the road) was unpaved, bumpy and after a whole quite grueling. It also. Must have been very taxing on our driver who did an excellent job. It all worked out but I would not recommend it for future visitors and there was no time that day to do anything as there was on all other days. Having said that, we thoroughly enjoyed our visit to Bhutan, will tell our friends about Windhorse in glowing terms, and hope to come back one day. There is one small matter that I forgot to finalize. Kezang mentioned the night before I left that I owe Windhorse a small amount for the hotel where you were able to arrange a separate room for me. Our departure was so early in the morning that all of us totally forgot about it. Could you let me know what the amount is so I can send it to you. I would also like to remind you of the invoice of the charges related to my wife's and my earlier trip cancellation dated as per my earlier email which the insurance company apparently requires. Thank you. Grand Cultural Tour of Bhutan. 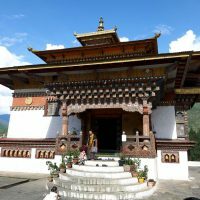 Bhutan is a fascinating country and visiting it was easily one of the most memorable trips I have ever taken. Dear Anand Apologies for not replying sooner. Thank you for setting everything up. We were very happy with the whole experience of our Bhutan trip. We always felt we were in good hands and enjoyed the company of both Soman and our driver, Chimi. 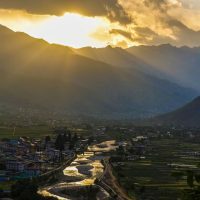 The way the schedule was arranged worked well and made us appreciate the very different and contrasting areas, from the remoteness of the village life of Jakar with the stunning open plans of the Phovjika valley [Blackneck crane valley] and the busier town life of Punakha, Thimphu and Paro. 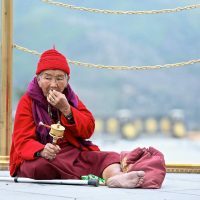 The highlights were trekking through the Bumthang and Phovjika valleys, the visit to Punakha Dzong, the archery competition in Thimphu and the trek up to the Tigers Nest. For us, making the trip in the first two weeks of September could not have been better timed, we could really enjoy the tour without the company of other tourists! - even finding ourselves as the only guests in an 80 room hotel in Jakar! The downside of travelling when we did, was missing the stunning views of both the high passes that we drove through. On both days the weather was not in our favour and the mountains shrouded in cloud. However this was a small price to pay for the advantages that we enjoyed in so often being the only tourists that were being shown around the many temples and sites. Many thanks for arranging such a memorable trip and we look forward to returning. 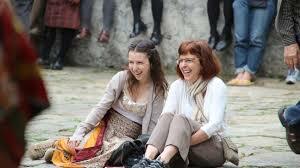 Grand Cultural Tour with festival Dear Anand, Thank you so much for the photos! I love them!! Jambay is obviously a great photographer. Our trip was wonderful. It exceeded our expectations. We are in love with the country and the people of Bhutan. Everything went very smoothly. Our guides and drivers were knowledgeable, professional, and friendly. The accommodations were very comfortable. 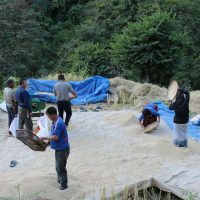 We hope that we can have the privilege of visiting Bhutan again sometime and to work with WindHorse. Flexible Bhutan Tour This trip was honestly so much more amazing in real life, and far exceeded my original (high)expectations. Thanks to everyone in the office at Windhorse who were always efficient and helpful in answering questions over e-mail, and willing to be flexible and build the itinerary round what I wanted to achieve - this is their greatest strength. They were always willing to say what could be done, while occasionally respectfully reining in my more extreme suggestions, which I now realise after my visit were at times too ambitious for the travel infrastructure of the country. Obviously particular mention for Pema & Tenzing with whom I spent most time on the trip itself. 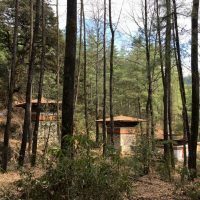 Pema particularly is a skilled and very caring guide, who went out of his way to be helpful at all times, and was very knowledgeable about Bhutan in a way that really helped me to understand and appreciate the country and culture. Tenzing was a very safe and reliable driver. Altogether an amazing team and an amazing experience - I will definitely come back to Bhutan, and definitely use Windhorse when I do! 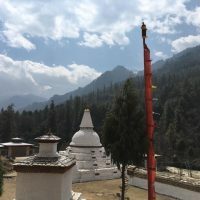 5 " " Grand Cultural Tour ( Penjor Lhendup) guide Hello Anand, Thank you for your interest in hearing about the experiences we enjoyed and our suggestions on what would have made our trip to Bhutan more memorable. We enjoyed our trip very much and found the Bhutanese people and culture to be fascinating and wonderful. Thank you for your interest in hearing about the experiences we enjoyed and our suggestions on what would have made our trip to Bhutan more memorable. We enjoyed our trip very much and found the Bhutanese people and culture to be fascinating and wonderful. We visited several areas of your beautiful country, visited many dzongs and temples, and heard a great deal about the religious significance and history of each. 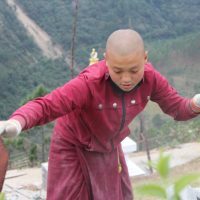 We enjoyed the hikes to the Tiger's Nest, and especially the hikes to Dzongdrakha and Khamsum Yuley Chorten since we walked through farming areas where we were able to catch a glimpse into the daily lives of Bhutanese people. We would have enjoyed the opportunity for more personal connections to people living or working in places visited. Such personal engagements can be provided by a tour given by a local representative. A tour of a place such as a school or nunnery can provide a great deal of interesting insight and cultural information that is memorable and supplementary to what a general guide can provide. We are aware that these sort of tours are available. We would have enjoyed such an opportunity. In general our accommodations and food were good. We particularly enjoyed the accomodations of the Khang residency. We found a few of our lunch time meals to be less than desireable, for example we did not care for the Yin and Yang restaurant in Thimphu. You may want to consider providing guides with a list of suitable options. Also, there was a farewell dinner listed in our itinerary and we are not sure what that referenced. We feel lucky to have been there for the lead up to the fourth King's birthday. We were able to see some of the preparations for the celebrations and found them to be very interesting and enjoyable. We found the road trip from Bumthang to Punakha to be grueling due to the very poor condition of the road. We were not provided with accurate information regarding the difficulty of this portion of the trip. We appreciate all the help and personal service provided by Ugen planning our trip. Once again, we enjoyed our experience in Bhutan and also really appreciate the services provided by the staff at Windhorse Tours. Dear Anand and Jambay, Sorry it took me some time to get back to you with feedback - the end of the year is always extremely busy at work. Sorry also that I was not able to meet Jambay when he was in London - I was away the Friday Jambay suggested to meet - otherwise it would have been my pleasure. I hope we meet another time - WTM events in London are held every year! Overall I was very pleased with my trip to Bhutan, and very happy I chose Wind Horse. 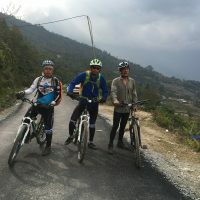 I would not hesitate to recommend Wind Horse to anyone planning a trip to Bhutan, as I have already done in my blog. 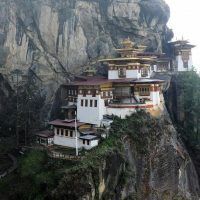 It is not the world's most read blog, but here is the link to the Bhutan post nevertheless: http://www.anjci.com/2015/12/bhutan-stunning-himalayan-kingdom.html. 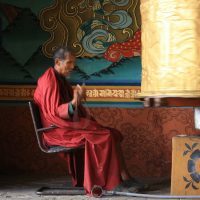 I have also put some photos from Bhutan here: https://www.flickr.com/photos/anutele/albums/72157657550248994. I must say I especially enjoyed Sonam as a guide and Tenzin as a driver. Both were a lot of fun and excellent at their respective jobs. I had a chance to compare, as two different pairs of guide/driver were taking care of me on the day I flew back to Paro from Bumthang - while Sonam and Tenzin were driving. The latters pairs were nowhere near as much fun or knowledgeable. The contractor guide in Paro actually seemed fairly uninterested in his job - the opposite of Sonam, who does guiding with utmost professionalism. TID -8775, June 7 - 17, 2015. Guide - Penjore Lhendup Sorry for the long delay, I have just returned home from my second trip and leave tomorrow for my next adventure! The hikes and the temples for me were the greatest parts by far. I was loving every second of those monasteries and hikes, it really made the trip for me. In terms of hotels one of my hotels was under construction while I was there and it wasn't an issue but it was indeed weird that it appeared I was the only one in the hotel itself. I don't have many problems with the trip, the biggest one is the road block issue but that is out of your company's hands. I was a solo traveler so I never had the tour guide lose me or anything so I am not the best person to ask about that. Hope that helps! I write from Kathmandu - just returned yesterday and I leave for USA tonight. I had a simply stunningly wonderful horse trek - there is little I can say that is better than that. I also had a very nice meeting with Rinzin and the other staff at Thimpu. 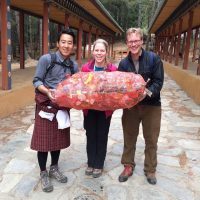 I am so very appreciative of the support of Wind Horse Bhutan and the willingness to sponsor my horse trek. Sonam and the rest of my crew were also wonderful and we had great fun in the beautiful mountains near the Tang Valley. I will attach a report I wrote and send along a few photos with this - but I will be in touch when I get home and we can discuss future horse trekking business and promotion. 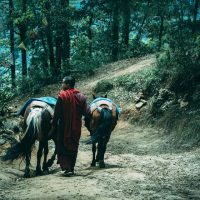 I have had quite some experiences on this journey with not only the wonderful horse trek but with the tremendous difficulties experienced with the earth quake here in Nepal with my initial trek. Again I shall not say too much because I have way too much to say to put into an email. Dear Anand - Our trip to Bhutan was FABULOUS. We can't stop talking about it with all of our family and friends. 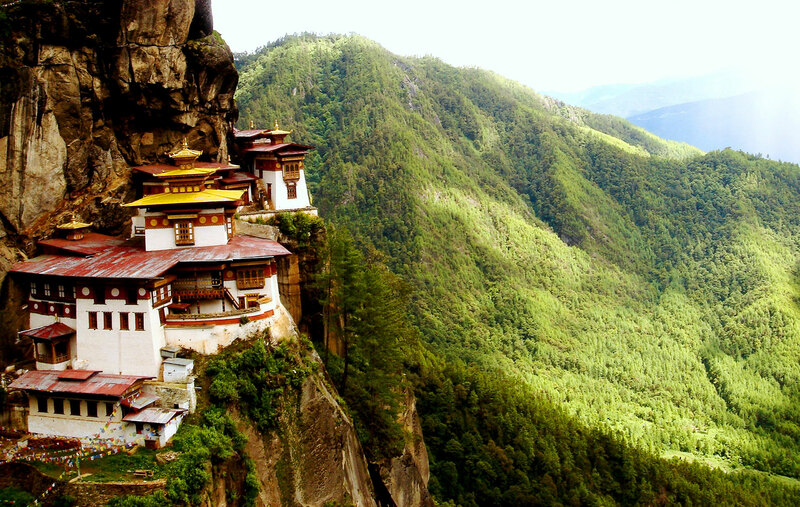 Bhutan is a magical country. All of our living arrangements were marvellous (especially in Thimbu). We absolutely LOVED our guide, Penjor and our driver, Arum. We have traveled extensively all over the world, but we have never had a more helpful, sweet guide as Penjor, or a better, safer driver than Arum. They were truly wonderful. We have absolutely no suggestions to better the trip. It was all wonderful. Please give our warmest regards to both. 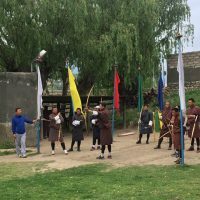 Jambay - Several weeks have passed since the group I participated with in Bhutan, said goodbye to that Beautiful country and that team of Guide and Driver Wind Horse provided. I write this day, to satisfy my own need to express the huge appreciation I continue to experience towards Wind Horse and your staff. Sonam and Dawa most assuredly provided the finest of experiences I could ask for. You may recall, that I asked to arrive some days prior to the others in the group as to honor my own interests when entering a country that I am a stranger to. The journey to the Haa area..the stay there .. The experiences encountered.. Then the arrival of the others and the well scheduled plans carried out by Sonam and Dawa.. We all are deeply appreciative of the fine organisation of details,and , to repeat myself, the generous and well educated guidance provided by both these sensitive and alert individuals. Thank you for all you and the company strive to deliver... I did enjoy meeting with you in Thimphu. Dear WH team, Warm greetings! A few months after returning to Italy from our honeymoon, we finally find some time to give you our impressions about the trip. During the planning phase everything went smoothly, and the regular exchanges with Jambay and Ugen made us feel safe and confident despite the distance and the many unknown aspects of the process. The few difficulties that arose during the payment and visa phases because of some wrong data were promptly managed by the team. Our only suggestion, as already written, would be to offer some other payment systems for people outside the USA so that the transfer fees, which are substantial, can be lowered (something like transferwise.com). TID - 8564 (Oct 23 - Nov 14, 2014) Dear Ugen and Jambay, Just wanted to let you know that the trip went very well. The itinerary worked fine, although a bit rushed in order to see all the wonders. We can let you know the particulars at another time. Above all we want to say that the guides were excellent and the drivers were especially careful. Our guide throughout Bhutan was extremely knowledgeable, respectful, fun to be with and always concerned with our well being. Lots of great memories. TID -8594 (Oct 23 - Nov14, 2014) Hello... We thoroughly enjoyed our trip to Bhutan -- except for the condition of the roads, everything was better than anticipated. Our guide Namgey was terrrific, as well as our careful and considerate driver Sonam--they both were exceptional in their jobs, and their patience, humor, and kindness completed the circle of excellence. They were very adaptable to our needs--we wanted to hike more than written in the original itinerary; seeing villages and mountaintops on foot was truly a highlight. 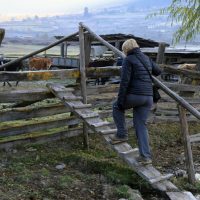 A short hiking trip, walking from village to village--staying in simple hotels or comfortable homes--might be something to consider for future guests. We also appreciated your company's suggestions for the few hotel upgrades we had; I do agree that seeing Bhutan in all upgraded hotels would be a mistake, but it was very nice to spend our last few nights in the luxury of the Naksel. Our friends, who went to Bhutan with Wind horse last year, came home with Wind horse's lovely book on Bhutan. How might we be able to receive one? All in all, we had a wonderful experience enjoying the beauty of the people and the country--and would highly recommend Wind horse to our friends. 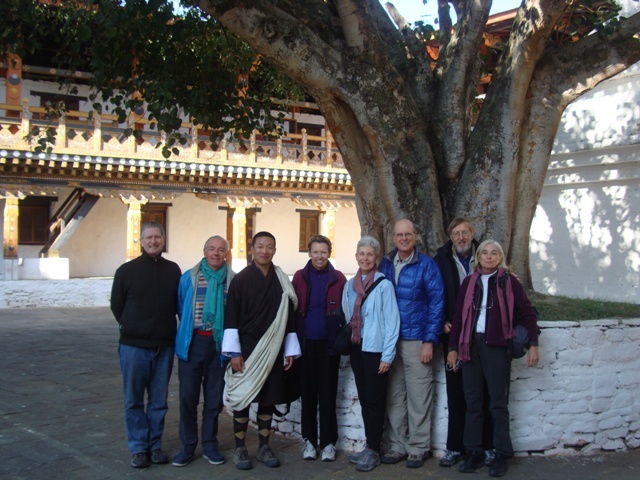 5 " " TID 756: Grand Gultural tour for Gregoire & Party Oct. 27 - 05, 2014 Dear Ugen and Jambay, I wanted to write to let you know how our experience with Windhorse in Bhutan (October 27 to November 5) went. First of all, thank you for setting us up with your "A" team. TID 775 Grand Cultural Tour with Bumthang Owl Trek ( June 06-18,2014) Hello Jambay, Sorry for this tardy email. We've been busy catching up after our trip. We'd like to start by saying our visit to Bhutan was a wonderful experience. 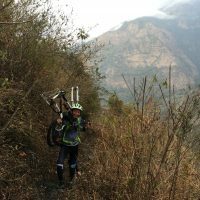 The countryside and the people were lovely and Windhorse, Yeshi and Tshering did a very good job of keeping us on track, entertained and fed. Our trek was a particular highlight. The time and effort which went into planning that amazing trip was awe inspiring. Your office handled all of our various financial issues (overpayment, cancelled flight) very impressively and communication was always timely . Thank you for all of that. We can think of three things that may be helpful to you in the future; 1) On the day of our arrival we were greeted by our temporary guide, Yonten. Our flight arrived rather late (fourish) to do any tours as many things close between four and five. I think that new arrivals are either excited or exhausted. We were excited. We wish Yonten had suggested a walk or some other introduction to our exotic new environment and if we were tired we could have said no. Instead he assumed that we must be tired and dropped us at our hotel. Yes, we could have pushed for a walk but we didn't which was our fault. Maybe we just look too old! 2) On the fateful "cancelled flight" day (day 2) we felt a bit adrift. Yonten had given us his phone number in case there was any difficulty with the flight. Initially the flight was merely delayed an hour so we waited. When it was delayed again and there was some thought that it might eventually be cancelled we decided that we should contact Yonten. Another party nearby who were traveling with their guide were discussing their alternatives and we weren't sure what ours were. We do not travel with a phone (perhaps this is rare) so we had to borrow one from an airline employee to make the call. Yonten did not seem to be nearby so we waited for him to arrive. It might make sense for the guide to be checking the flight status so they can be close by when decisions need to be made. We know that in a situation like ours the guide can't sit in the departure lounge since they are not flying. Once Yonten arrived he was very accommodating and offered us several options. We wanted to be in Bumthang for our trek two days later so the overnight drive was our best option. Our driver did a spectacular job getting us across the country to Trongsa in fog, rain, mist and dark without a complaint. He is to be commended. We realize that neither Yonten nor the driver had anticipated their extended time with us and they remained pleasant and helpful through the whole experience. 3) This falls into the "wish" category. One of the wonderful things about Bhutan is it's seeming remoteness. It would be nice if there were some additional lodging choices to reflect this fact. Although most of our accommodations were fine, there were a few that felt too large and overrun with bus tours. Those traveling in small groups might like the choice of a guesthouse or something more intimate. It seemed that rather early in the planning phase we were already booked into our hotels and we could not suggest other places. I know booking quickly must be important if you are traveling in high season but we weren't. Having the choice of smaller, more intimate places would be greatly appreciated. Do they exist? Perhaps not. We hope these don't sound too much like complaints because they really aren't. We had a lovely trip and hope to return to Bhutan at some point in the future. All the best. 5 " " Bhutan tour for Alyssa & her friend TID: 8544 Hi, Anand. 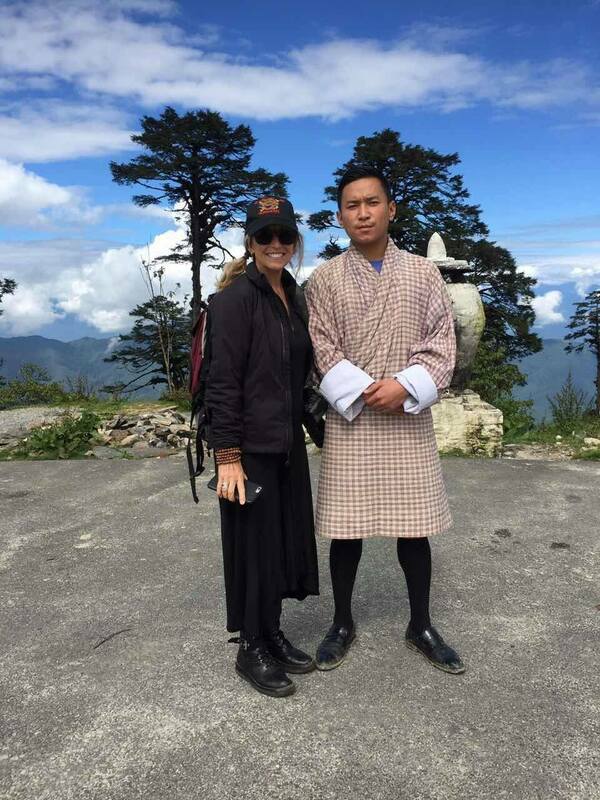 Thank you for the following-up email.My sister and I had a great time in Bhutan thank to Windhorse Travel and its tour guide Sonam and driver Sonam. We were very happy with the service and the arrangement of the tour. 5 " " Grand Cultural Tour for Lemonick TID: 786 (March 16 - 26,2014) The trip was amazing--ideal in every way. We're planning to post very positive reviews everywhere we can think of, but I wanted to locate the paper where I wrote down Namgay and Chimi's names so I can mention them personally. Grand Cultural Tour for Lemonick TID: 786 (March 16 - 26,2014) The trip was amazing--ideal in every way. We're planning to post very positive reviews everywhere we can think of, but I wanted to locate the paper where I wrote down Namgay and Chimi's names so I can mention them personally. The itinerary was great, the country and culture and people were every bit as welcoming and fascinating and beautiful as we'd hoped, and our guide and driver were simply outstanding. 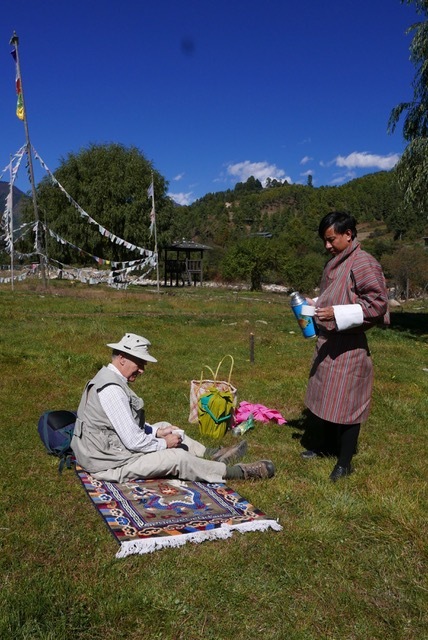 Dan and I enjoyed our time in Bhutan. It is a beautiful and unique country. 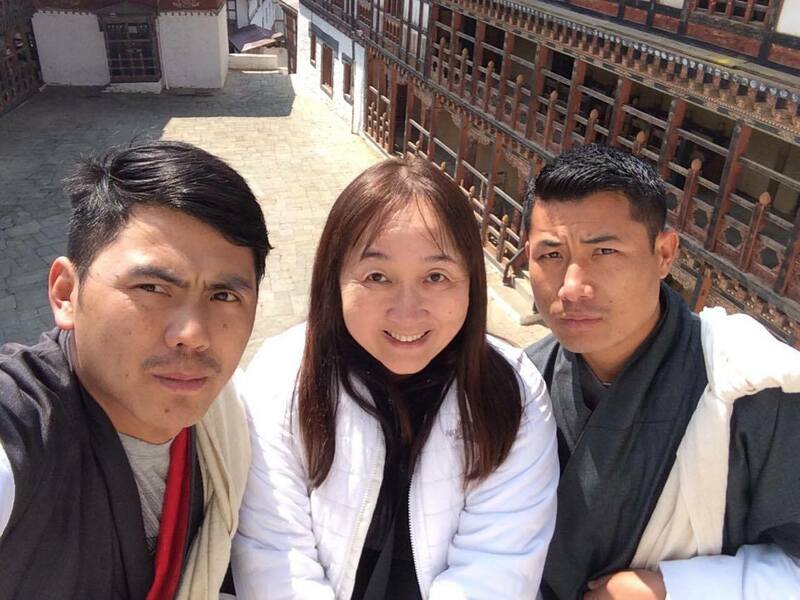 Sonam was a wonderful guide who introduced us to the stories of Guru Rinpoche (the Second Buddha), Pema Lingpa (the treasure finder), Zhabdrung Ngawang Namgal (the founder of Bhutan), the five kings of Bhutan, subduing the demons, and fulfilling prophesies. We learned more about Buddhism through Sonam’s patient explanations, too. 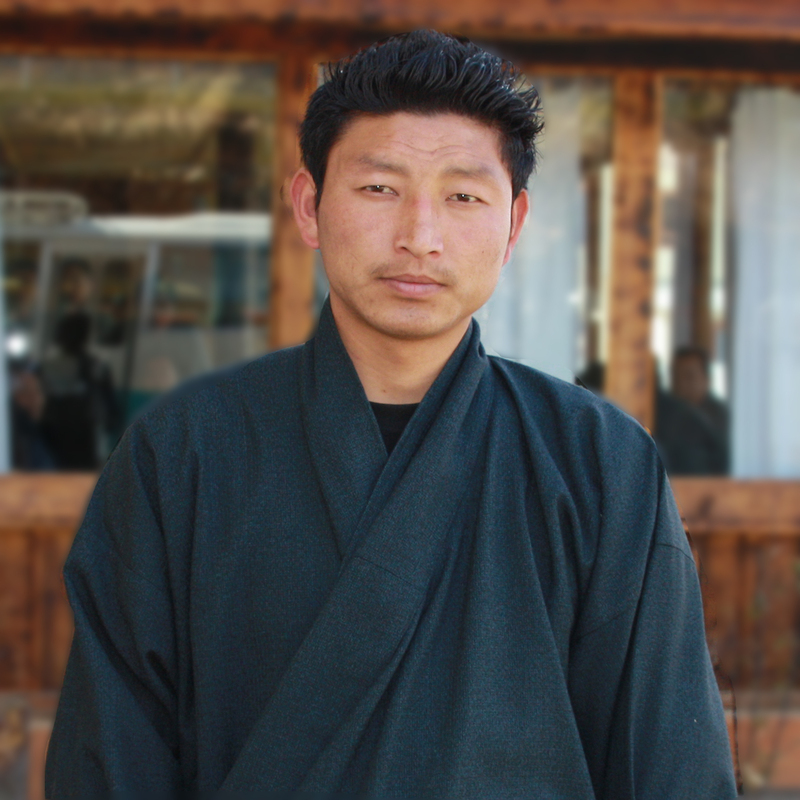 Our driver, Dawa, safely transported us through Bhutan with great skill on difficult roads. We enjoyed stopping at the different arts and crafts shops. The hotels were good, we liked the food very much, and tea time became a favorite stop. We appreciate that you are taking the rat incident seriously. Other than the furry little guy, the hotel was very nice and clean. The only other incident that I didn’t mention at the time due to becoming accustomed to seeing dogs running around in Asia was when we were at the Mountain Lodge in Jakar. There were some large dogs running loose on the property whose role seemed to be guarding their domain. At one point when Dan and I were coming from our room to the dining room we found one of the barking dogs between us and the dining area. Not knowing if we were perceived as intruders and the staff was not present at the time, we were not sure what to do. Afterwards, when we found that the dogs were okay with strangers walking around then we felt more comfortable. Since some people are afraid of dogs, the staff should make sure their guests and the dogs are okay with each other. Again, this was an amazing experience that Dan and I will always treasure. Overall, it was an excellent trip, which left us with unforgettable memories and a longing to do it again. TID 676 Mr.& Mrs Szymanski Grand Cultural Tour Bhutan ( 3.10.13 - 12.10.13) I just returned from a trip to Bhutan. TID 676 Mr.& Mrs Szymanski Grand Cultural Tour Bhutan ( 3.10.13 - 12.10.13) I just returned from a trip to Bhutan. I was planning it for almost a year in advance, reading travel books, travelers’ reviews, and checking internet pages of many tour companies. After a thoughtful consideration I picked the Wind Horse Tours & Treks as our guides. The experience was very positive right from the start. The exchange of information through emails was exactly what I was hoping for. My emails were promptly answered, the information provided was pertinent to my questions, and my concerns were addressed right away. The plan of our tour was clearly laid out, and changes were easily accommodated. Our guide was Mr. Sonam Palden and I have to say we could have not asked for a better guide. Mr. Sonam is very knowledgeable on all aspect of Bhutan, history, religion, nature, culture, even cooking. He is very well organized, everything was taken care of so efficiently; such as hotel checking’s, meals, flights, entry tickets, etc. He also planned our days so that we get the best experience, for example, least crowded, best light for photos, etc. He was always on time. He is very likeable with a ready smile. He was very concerned about our well-being and happiness. For example, I made a slight remark that the food in the hotel was not as tasty as in other places and for the following day he organized a dinner at the local restaurant, and that dinner was just excellent. And an extra bonus, he is a good photographer so finally my husband and I have good travel photos of the two of us together. We have also liked a lot our driver Mr. Sonam Phuntsho. He is a very confident, safe driver. Well-mannered and pleasant. Always around when we needed him and always ready to help. He kept the car very clean (by the way, the car was very comfortable).We were happy with the hotels selected, and we enjoyed the meals. We liked the pace of the tour. Overall, it was an excellent trip, which left us with unforgettable memories and a longing to do it again. TID 700 John Stirk family Grand Cultural Tour (10.10.13- 19.10.13) We enjoyed our trip very much. I particular we found the guiding services of Namgay and the driving service of Rinzin of very high quality. 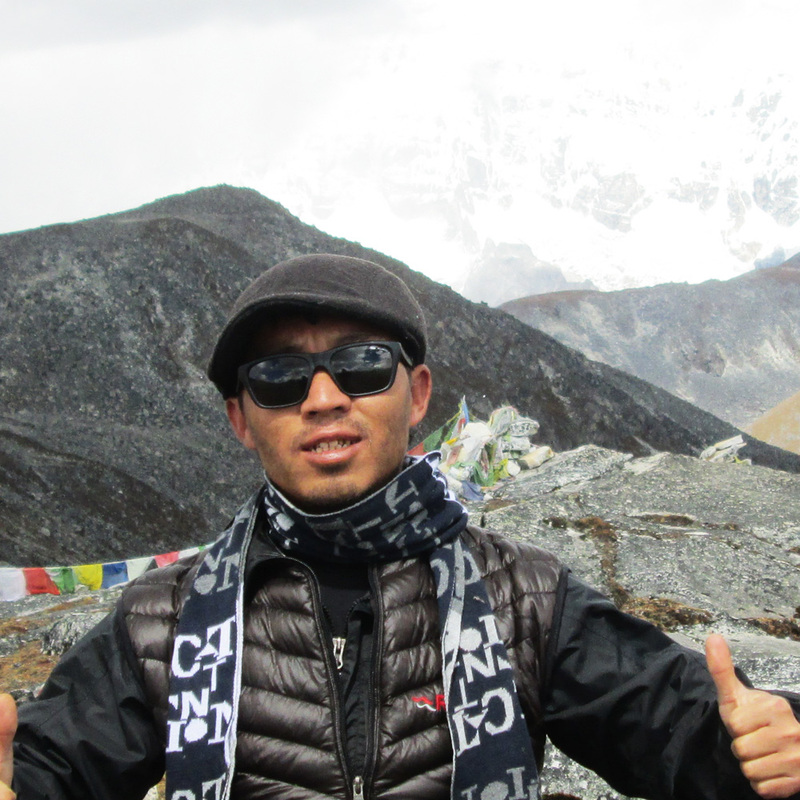 Namgay was a very knowledgeable guide who made huge efforts to ensure that we had the best possible trip. And Rinzin showed an amazing ability to concentrate for long periods of time despite very difficult driving conditions. On one occasion we encountered a crazy driver coming in the other direction around a blind corner overtaking and driving on the wrong side of the road on the road between Thimpu and Paro. But Rinzin calmly swerved off the road and probably saved our lives. On many of the other roads the speed was generally slow but not on the road between Thimpu and Paro, the driver who was in the wrong was going at least 80kmph. So we were lucky Rinzin was driving so well. We enjoyed the things that were included on the itinerary and would not make changes to the places we visited. And we found the standard of accommodation to be high and liked all of the places selected. There were two things we found disappointing. Firstly we were not able to visit the tower museum in Trongsa. This was because we arrived on a Sunday when it was closed, and Monday the 14th was a public holiday and so again it was closed. It would have been nice if this was pointed out when the itinerary was devised so we did not look forward to something that never had a prospect of occurring. And secondly we found that there are some very nice restaurants in Bhutan but going to them was not part of the offered itinerary. For instance, Friday 18th October was my 41st birthday and I wanted to do something nice to celebrate. In the inflight magazine on Druk Air I found an advertisement for a restaurant called Bukari (located in the UMA resort in Paro). We asked to go there but initially found that it was booked out. Somehow Namgay managed to get us in there anyway (he was a very good guide) but it would have been nice if options like going to this kind of dinner were made available when we were organising the trip. It really did feel as though the standard itinerary was just being rolled off the shelf with no effort to customise it to our needs. Ok, I agree that in many of the towns in Bhutan there are no options available to the standard buffet dinner at the hotel but in Thimpu and Paro I found that there are. I know that your explanatory brochure says that meals will not be a highlight of our trip, and I can agree that by the end of the trip we were tired of eating rice and mixed vegetables but the thing is there are options available. Bukari restaurant is an international class gourmet restaurant and eating there was a great way to celebrate my birthday and finish the trip. It just would have been better if organising it did not cause any difficulties for the guide. Anyway, the negative comments at the end in no way mean that we were dis-satisfied with the trip. We enjoyed it immensely. Rather that there were a couple of things that could have been done better. 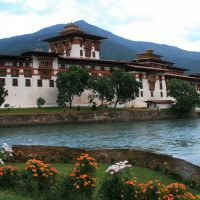 The reason I feel that it would be good if try to tailor things like the Bukari restaurant or other options into the trip is because it is so difficult to find out what options may be available in Bhutan prior to arrival. I found the internet searches don’t always achieve good results yet when you arrive there are indeed some good options. Thanks again for organising a very good trip for us. TID 689 Bhutan Tour for Christos and friends (6.10.13-15.10.13). The trip over all was very nice. Your country is very beautiful, with great landscapes and nice monuments. People are very friendly, everywhere we felt safe and warm. The only problem was the roads, especially the road from Punakha to Bumthang. This kind of roads need better cars to be comfortable for clients. So, I think if you can use a better car, then it will be better for the trip.Your driver was very friendly, and careful on the road. Your guide Namguel, in total was good. He gave us adequate information about the places we visited, but at the end he gave us a bad feeling, maybe because the clients don’t give him big tip. When we arrived to Paro Airport for our departure, he left us out of the airport and didn’t follow us inside the airport, at DrukAir desk to check if our flight finally happened or not (the weather was bad and the possibility for cancellation was big).Overall, our trip was perfect and I am waiting for my next clients to visit you again. I hope to see you in my next trip. TID 671 Culture Scapes Bhutan Tour from Sept 10 to 22 Sept 2013 11 Days of Journey in Bhutan were organized and carried out by travel company WINDHORSE. They knew how to match our preferences and special requests. It was a legendary journey. The best representatives of this legendary country were Mr. Sonam Pelden, the guide and Mr. Tshering Jamtsho, the driver. They succeeded to make those fascinating legends become reality. Sonam, an Oxford-English speaking guide, led us to this wonderful country. We met with him what Buddhism means in Bhutan. Mr. Tshering, the driver, who remained silent and smiling all the way, led us skillfully winding roads and sometimes shabby, of Bhutan. TID 607-Grand Cultural Tour of Christian & Wife (Dec. 21-30, 2012) My wife and I had a great time in Bhutan, thank you. I chose your company because talking to Ugen on the phone was very helpful before I made the booking. I liked knowing I had someone in the US I could call with questions. We were never disappointed by your company at any point during the trip and I’m glad I went with Wind Horse. Tashi our guide and Yamraj our driver were easy to communicate with and get along with. Tashi went out of his way to help make a few special moments happen for us. He was very knowledgeable and passionate about Buddhist culture and history. At Tiger’s Nest, our guide and another person’s guide teamed up and took turns explaining things, and I could tell the difference in their knowledge of the history and meanings of things we were being shown. Israel - Lower Galilee - Sharona Sep 20 -Oct 01, 2012. 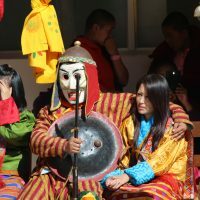 5 " " TID 559: Culture Escapes Bhutan Tour Sep 20 till 01 Oct , 2012. Dear Pelden & Sonam, Only now, after coming back from another trek - in Ethyopia - I find the moment to thank you and your company, again and again, for the imaginary and unforgottable trip around Bhutan last October. 5 " " Grand Cultural tour Bhutan Tour for Mr. & Mrs. Scott (Oct. 25-Nov. 5, 2012)Team Wind Horse, A thank you to your team, our guide and driver for a wonderful time in Bhutan. The hospitality was terrific and we appreciated the hard work of our crew. Thanks again. Grand Cultural tour Bhutan Tour for Mr. & Mrs. Scott (Oct. 25-Nov. 5, 2012)Team Wind Horse, A thank you to your team, our guide and driver for a wonderful time in Bhutan. The hospitality was terrific and we appreciated the hard work of our crew. Thanks again. Limerick, Ireland Sept 21-Oct. 01, 2012. From 30 September - 20 October we were in Bhutan with the SNP-group. Sonam Loday was our guide and we appreciated very much his professional way of guiding us through your wonderful country. He was very kind, took care of people, was interested in people and willing to tell a lot about Buddhism, normal life and Bhutan. on the trekking we were a.o. accompanied by Tshering. Unless I think that the total staff was acting in a professional way, these 2 guys were special in their way of making contact with us. 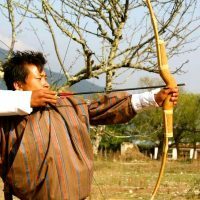 In my opinion also Tshering can develop to a professional guide. I would like to recommend to take care of keeping them both in your permanent staff. Ugen and company, Thank you for a great tour in Bhutan. Sharon and I had a wonderful experience. We so much appreciated your efforts to facilitate the trip at the last minutes and find us an excellent guide and driver. I posted on Trip Advisor and Lonely Planet and was happy to tell others about the great service. We will send any business your way that we can. Cheers, Craig and Sharon PS Posted following: I recently finished a 12 day trip with WindHorse Tours in Western and Central Bhutan (May 2011). A lady friend of mine accompanied me for the first 6 days for the Western portion. 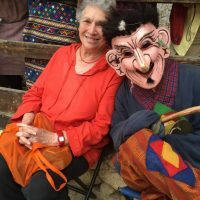 We both had a wonderful experience and would highly recommend Bhutan as a travel destination and WindHorse as an organizer. Our decision to go was last minute and required a custom itinerary due to the different time lines available to the two travelers. From our first contact with Mr. Ugen in MN, USA until the end of the trip, we had personalized attention and delivery of promised services. They were recommended by Lonely Planet which is always a good gauge and we would recommend them now after our experience. Bhutan at the end of May is not the classic time to go. The festivals are not going, the view of the high mountains rarely happens, and the Rhodedendrum forest blooms are almost gone. 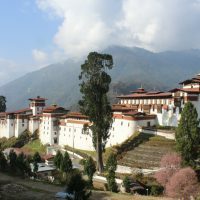 But the small number of tourists, seeing the procession of the Chief Abbott from Punahka to Thimpu, and the jacarandas in bloom at the Punaka dzong made up for it. While there may be better times to go, for us, this was still a very good time to go and we had nice weather and travels. For the true Bhutan officianado or someone who wants the "perfect" time to go, then I guess earlier or later in the year (March or October perhaps) would be best. But if you are going on a cultural tour (not trekking or there for a specific thing like birdwatching or rafting), then we would say don't be afraid to go in May if this is your only time to go. Miriam R x 02 : 01-08 November 2010 Hi Ugen, I have now been back for a few days from my wonderful trip to Bhutan and started to settle back in. It is important to me to take a moment to thank you, Wind Horse Tours and your great team for allowing me to enjoy such an amazing experience. I'd also like to congratulate you to your very professional team of guides and drivers: Sonam was a delight to have as a guide and trek partner. He was fun to be around while teaching me fundamental knowledge about Bhutanese history. He was the perfect trek guide - providing guidance and ensuring that I had a safe & pleasant time, while also allowing me the space I seeked to be alone out in nature. 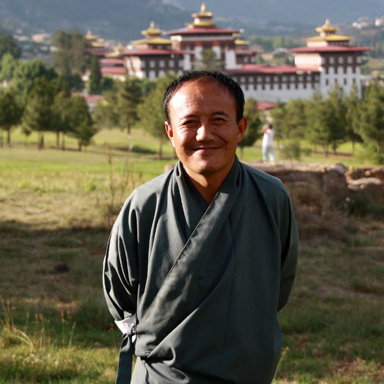 Pema's warm and kind personality provided a taste of how welcoming Bhuatnese seem to be towards foreigners. I took great pleasure in seeing him again and again during my trip towards the East since he is such a wonderful person to be around. I can well imagine how he could be a tremendous asset to your line up of guides. Guddu is simply a rock star driver. I did not flinch once when he drove us through the infamous 'Namling Cliffs' which means a lot when coming from a 'control freak' who always drives herself almost anywhere in the world. (Please feel free to forward to Guddu since I do not have his email.) I probably do not have to tell you much about Jambay who clearly is a seasoned guide with tremendous knowledge, but most of all patience! My curious mind must have thrown hundreds of questions his way which he was always willing to answer in-depth. So often we tortured him with the same question again and again in our eagerness to learn more about Bhutan. He was also very flexible to add sights to our itinerary as they arose our interest on the way. (And then poor Guddu had to drive us there!) Like wise Jambay was great to spend time with and I enjoyed his personality. Bhutan mesmerized me with its culture and architecture, but most of all its people. I appreciated to which extend I was made to feel welcomed, especially to the festivals. Bhutan opened and warmed my heart still long after I have left. I simply can not wait to return. I'll be seriously interested in doing the Snowman trek in the 2012 season and have already started to discuss this with some of my mountaineering friends. I'd like to stay in close contact with you to discuss this endeavour should I find a few like minded souls. Otherwise I most likely return to explore some of the areas I have not seen yet. In any case, I'd be very happy to serve as a reference for Wind Horse Tours should you have a need. Also let me know if you ever make it to the Bay Area. It would be nice to meet you in person. Wind Horse Tours and specifically you did a very good job in providing information and setting expectations for the trip. There are however two things which I'd like to mention since they could help improve some of the information provided: 1. We only learnt once in Bhutan that 500 and 1,000 rupee notes are no longer accepted. It might help to add this to the information you currently provide so that travelers change larger bills before hand. 2. The multiple entry process into India was a little misleading. Perhaps you can reword the current information so that travelers do not expect to be actually handed a 'waiver'. No waiver is given during entry. It seems they just make a remark in their system at best. I hope this email finds you well (and everybody copied). I also hope that Bhutan will continue to succeed in its fine balance of development/modernization and preservation of its culture and heritage. A wooden bridge over the fence – a common sight in Phobjika.